On October 14, the Georgian Orthodox Church celebrates the Day of Svetitskhoveli Cathedral. Svetitskhoveli Cathedral, also known as the Cathedral of the Living Pillar, is one of the most venerated places of worship in Georgia. Svetitskhoveli Cathedral is located in Mtskheta, a historical town near the capital city of Tbilisi. The cathedral is believed to be the site where the mantle of Jesus Christ is buried. According to legend, a Georgian Jew named Elias bought the seamless robe of Jesus from a Roman soldier and brought it to his native town of Mtskheta. Elias gave the robe to his sister Sidonia. Sidonia was overwhelmed by emotions evoked by touching the sacred object and died instantly. Elias could not remove the robe from her grasp, so he buried Sidonia with the robe. A large cedar tree grew from her grave. In the 4th century, Saint Nino ordered to build the first Georgian Church at the burial site of Sidonia and Jesus' mantle. So Svetitskhoveli Cathedral was founded. It had been the principal Georgian church for about a thousand years before being replaced by the Holy Trinity Cathedral of Tbilisi. 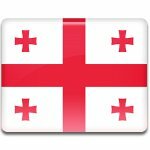 Day of Svetitskhoveli Cathedral (Svetitskovloba) is an official public holiday and non-working day in Georgia.